In this era of contemporary styling with traditional outfits, it’s all about posing your own style with every attire. Creating a spot-on ensemble for the occasion is one of the major tasks that we, being women, like to accomplish! Styling and pairing our clothes is what we plan everyday and even more so if it’s an occasion we are looking forward to. After wearing a selection of suits for pretty much every occasion, boredom is bound to hit. It’s time to try something different! Pick up a high waisted lehenga that can be paired in numerous ways and which shall be fuss-free when it’s time to hustle! Here are some styling options that you can try out! 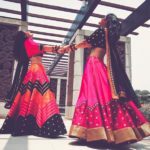 If you’re wondering the number of times you’d get a chance to flaunt this high waisted lehenga, pick up a plain design that can be easily passed on as a high waisted skirt! 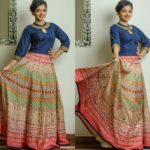 Pair it up with a heavy choli or blouse that fits you perfectly and without the requirement of heavy jewellery, it shall gracefully highlight your elegance. In case you’d like to create an ensemble through some mix and match in your closet, another idea for a chic style is to create a plain ensemble through a high waisted skirt with a blouse and pair it up with a heavy dupatta that shall remain the highlight of your outfit. 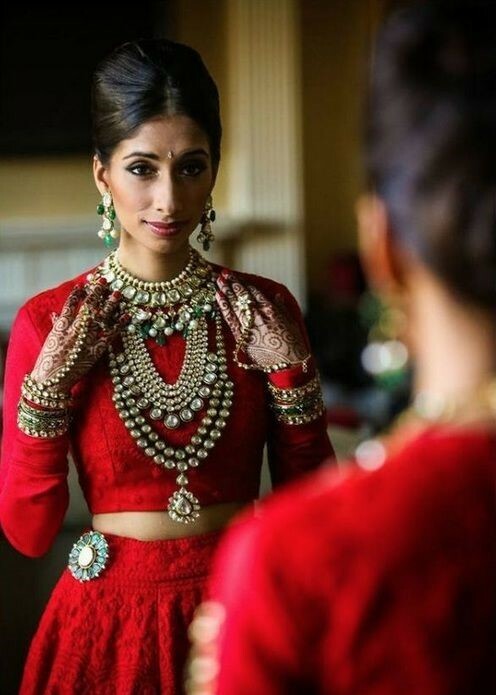 With the addition of minimal jewellery or even a kamarbandh, you shall stand out of the crowd at your very best! 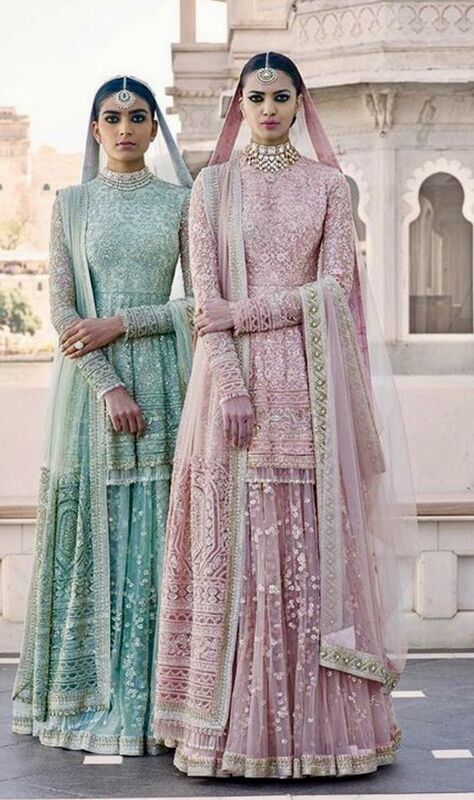 Want to ditch the dupatta entirely? 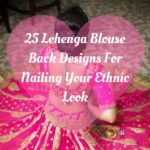 Create a perfect set of lehenga and blouse that represents the same design and textures and adds a flowy look to your style. Throw in a handbag or even earrings highlighting the colour and your features, it’s a combination that shall never go out of style. If you’re a trend follower, this style is meant for you! 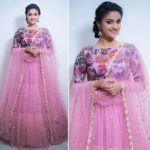 With the latest trend of pairing an off-shoulder design with your lehenga, you can pick up a heavy off-shoulder that you can also pair up later for your evening wear. Add on earrings or a choker for the occasion and you’re ready to step out of the door! 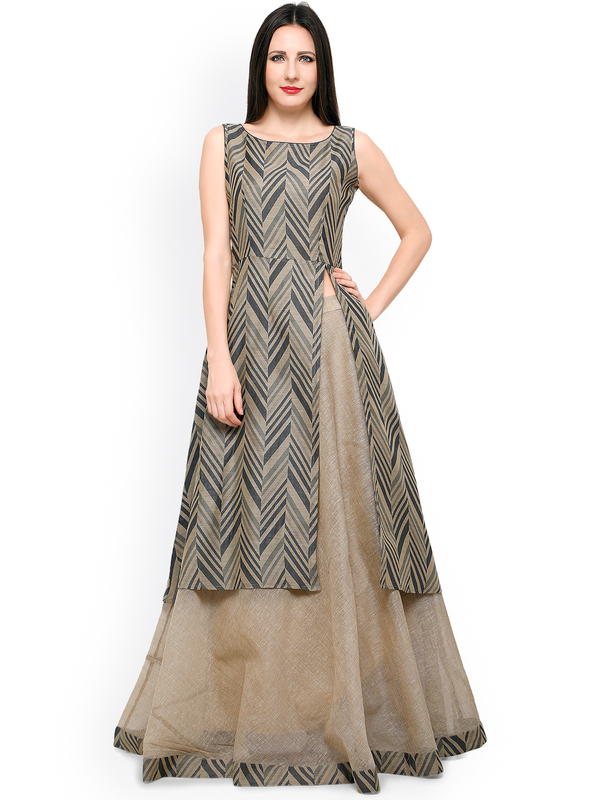 Leave a mark of your style with this trend and be ready to answer a lot of questions! 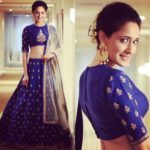 For all those who don’t prefer heavy lehengas and would rather go on the minimal side of things, pick up a textured lehenga that shall subtly put your point forward. Pair it up with heavy jewellery or even multiple pieces of light ones that shall add a little bling to the occasion. Create a contrasting pair up or stick with the gold/silver base that always work, it’s a blend that shall make heads turn. 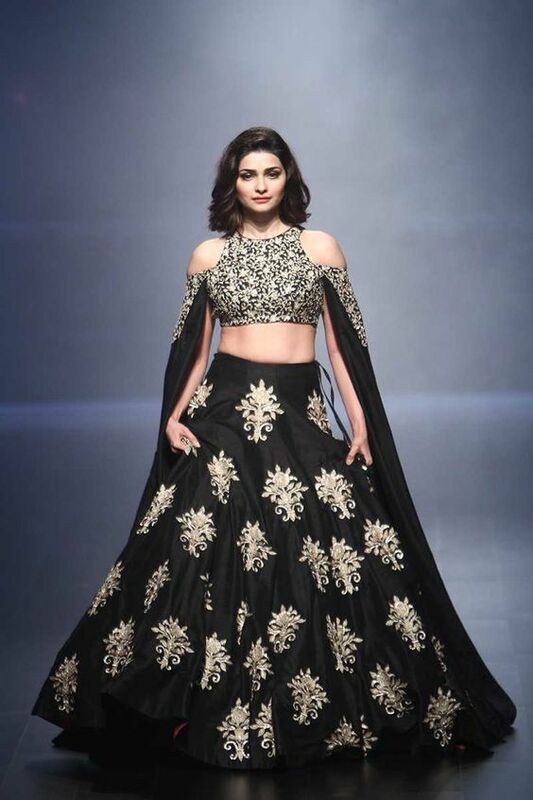 In case you’re looking for a more contemporary style, pair up the high waisted lehenga with a crop top that shall leave room for you to flaunt your waist. Through this pair up you also have the option of creating a contrasting combination or even a gold/black one that shall leave room for you to try multiple colour options and varied number of occasion wear options! 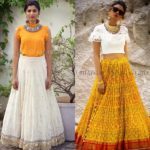 Another trend of the year is pairing up these high waisted lehengas with slit kurtis that shall create a flow to your ensemble. Pair it up with minimal jewellery or leave it out all together depends on the combination you’re going for. With the various options available in the market, you can pick up a set or create your own arrangement by pairing up different shades and designs that shall be all about your style. With the increasing number of short kurtis in the market, the option presents itself for pairing it with high-waisted lehengas as well! Create a monochrome ensemble of a contrast colour by pairing it up with minimal jewellery or if you’re the center of attraction at the occasion, add on maang tikkas and rings that shall flaunt your features and add on to your heavy outfit. Who says sleeves can’t do the talking? 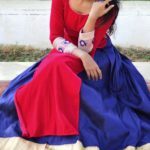 In the era of great of sleeve designs and a variety of sleeve designs available in the market, find a crop top or a choli that either has exaggerated sleeves or even ones with sleeves. Focusing on your shoulders, this design works best for apple and pear body shapes that give the opportunity for your torso to be highlighted. Ponchos? Hippy? Not anymore! 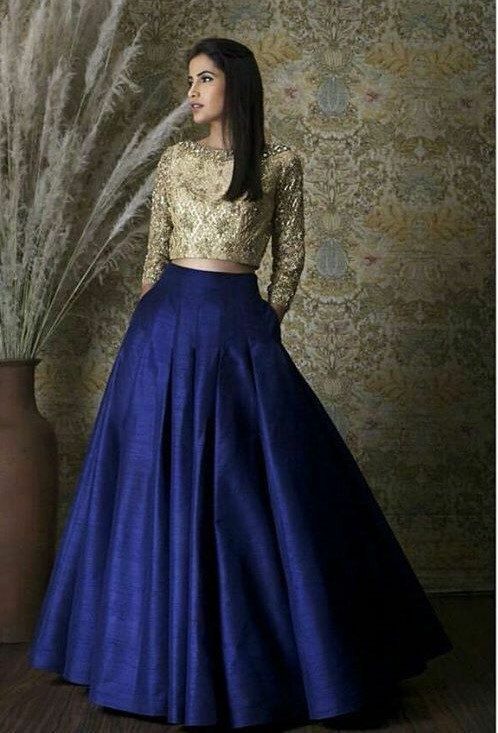 Adding on to your pairing options, couple your lehenga with a layered crop top that subtly shows your waist line but adds on an intriguing factor to your ensemble! A net layered pairing, it’s bound to attract some questions! Pair it up with minimal hand or ear jewellery and tie your hair up to flaunt your neckline in the best way possible! With numerous styling techniques to try out, there’s always a contemporary way that you can create depending on the style you’d rather flaunt for the evening. Keeping it in trend and even more exciting, try out some of our styling tips and discover a different side of you!